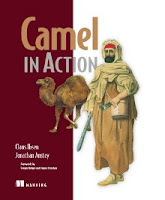 Jon Anstey's Blog: Camel in Action is complete! I am really pleased that Manning found the Camel they promised us for the front cover. We regard this book as even work and share between the two authors of us - its a 50/50. If Jonathan didn't come along to safe the project, it would have been dropped to the floor. Yes writing a book is hard, much harder than you would think. Its not only words on paper, its also people. Having the right team is key to be able to move forward. And Manning is impressed that we pulled it together in 15 months, when we got on right track again. Thanks Claus. Was great working with you for sure!